December 29, 2016 – CHIKARA: Merlok defeated Nytehawk. February 4, 2017 – National Pro Wrestling Day: Space Monkey defeated Ashley Vox, Delmi Exo and Merlok in a 4-way elimination, 1st round of the Young Lions Cup. February 12, 2017 – CHIKARA: Merlok defeated Delmi Exo. March 5, 2017 – CHIKARA: Merlok defeated Fire Ant. March 19, 2017 – CHIKARA: Merlok vs. Razerhawk ended in a double count-out. March 31, 2017 – CHIKARA: The Furies (Fire Ant, Icarus, Ophidian, Solo Darling and Travis Huckabee) defeated Cajun Crawdad, Hermit Crab, Juan Francisco de Coronado, Merlok and Wani. April 1, 2017 – CHIKARA: The Furies (Ashley Vox, Delmi Exo and Obariyon) defeated Cajun Crawdad, Hermit Crab and Merlok. April 23, 2017 – CHIKARA: Ashley Vox vs. Merlok ended in a double count-out. May 6, 2017 – CHIKARA: Merlok was in the infinite gauntlet match won by Solo Darling. May 27, 2017 – CHIKARA: Merlok defeated Crossbones. July 8, 2017 – CHIKARA: Cajun Crawdad, Hermit Crab and Merlok defeated The Furies (Ashley Vox, Delmi Exo and Obariyon). July 23, 2017 – CHIKARA: Merlok defeated Dr. Rod Diamondfire. August 5, 2017 – CHIKARA: Dasher Hatfield defeated Merlok. September 1, 2017 – CHIKARA: Cajun Crawdad, Hermit Crab and Merlok defeated Jody Fleisch, Johnny Moss and Jonny Storm in the 1st round. September 2, 2017 – CHIKARA: Cassandra Miyagi, DASH Chisako and Meiko Satomura defeated Cajun Crawdad, Hermit Crab and Merlok in the quarter-finals of the King Of Trios tournament. September 3, 2017 – CHIKARA: Merlok defeated Sylverhawk. September 17, 2017 – CHIKARA: Merlok defeated Cabana Man Dan. September 30, 2017 – CHIKARA: Merlok defeated Ashley Vox. October 28, 2017 – CHIKARA: Merlok defeated Missile Assault Man. November 5, 2017 – CHIKARA: Merlok defeated Obariyon. November 19, 2017 – CHIKARA: Cajun Crawdad, Hermit Crab and Merlok defeated Xyberhawx2000 (Nytehawk, Razerhawk and Sylverhawk). December 2, 2017 – CHIKARA: Oceana defeated Merlok. December 9, 2017 – Excellence: Havoc defeated Manny Martinez in the 1st round. Havoc defeated The Proletariat Boar Of Moldova in the semi-finals. Hallowicked defeated Havoc to win the tournament and vacant Excellence title. January 28, 2018 – CHIKARA: Merlok and Oceanea defeated Cajun Crawdad and Hermit Crab. February 17, 2018 – CHIKARA: The Creatures Of The Deep (Cajun Crawdad, Hermit Crab, Merlok and Oceanea) defeated Fire Ant, Hype Rockwell & The Throwbacks (Dasher Hatfield and Mark Angelosetti). March 17, 2018 – CHIKARA: The Creatures Of The Deep (Merlok and Oceanea) defeated To Infinity And Beyond (Cheech Hernandez and Colin Delaney) to qualify for the Tag World Grand Prix. March 31, 2018 – CHIKARA: Cornelius Crummels, Sonny Defarge & The Creatures Of The Deep (Merlok and Oceanea) defeated Green Ant, The Rumblebees (Solo Darling & Travis Huckabee) and Thief Ant. 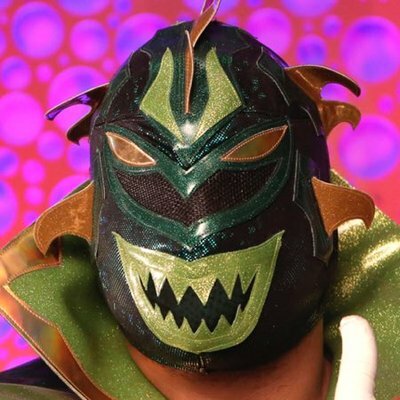 April 14, 2018 – CHIKARA: The Creatures Of The Deep (Merlok and Oceanea) defeated Los Ice Creams (El Hijo del Ice Cream and Ice Cream Jr.) in the 1st round. The Creatures Of The Deep (Merlok and Oceanea) defeated The Rumblebees (Solo Darling and Travis Huckabee) in the semi-finals. The Throwbacks (Dasher Hatfield and Mark Angelosetti) defeated The Creatures Of The Deep (Merlok and Oceanea) to win the Tag World Grand Prix. April 21, 2018 – CHIKARA: The Creatures Of The Deep (Merlok and Oceanea) defeated The Xyberhawx2000 (Razerhawk and Sylverhawk). April 28, 2018 – CHIKARA: The Creatures Of The Deep (Cajun Crawdad, Hermit Crab, Merlok and Oceanea) defeated Green Ant, Los Ice Creams (El Hijo del Ice Cream & Ice Cream Jr.) and Thief Ant. May 5, 2018 – CHIKARA: Merlok was in the infinite gauntlet match won by Danjerhawk. May 26, 2018 – CHIKARA: The Creatures Of The Deep (Hermit Crab, Merlok and Oceanea) defeated Icarus & Xyberhawx2000 (Danjerhawk and Razerhawk). June 23, 2018 – PPW: Green Ant, Officer Warren Barksdale and Thief Ant defeated Merlok & The Proteus Wheel (Frantik and Volgar). Merlok drills Razerhawk into the mat with a Doctor Bomb! Merlok powers everyone up for a ten-man suplex!